ResMed’s advanced algorithm is proven to provide effective therapy on a breath by breath basis accounting for flow limitations. Pressure is smoothly increased over the duration of the limitation and decreases again when the event clears. This is beneficial for active sleepers who experience a great number of events when changing position during sleep. AutoSet Response is also available to make pressure increases even more tolerable and gentle. The AirSense™ 10 AutoSet can be set to automatically adjust or to a single pressure mode if desired. The Humidair™ humidifier is built into the AirSense™ 10 machine making for a smaller overall footprint on the bedside table. Humidity level is easily adjustable from the My Options screen and offers 9 setting levels. Select 1 through 8 with 1 being the lowest level of humidification, and 8 being the highest, or turn the humidifier off entirely. Add the OPTIONAL ClimateLineAir™ Heated Tube to optimize humidification with Climate Control’s Auto function. The system considers the temperature of the room air to provide optimum humidification with minimal rainout condensation. 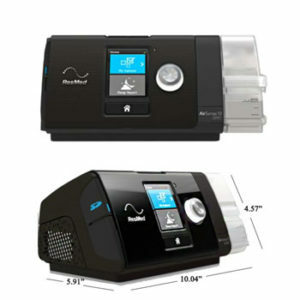 ResMed machines offer EPR™ making breathing with a CPAP device more natural by adjusting the amount of pressure delivered during exhalation and inhalation. EPR can be turned off, or set to 1, 2 or 3 with 1 being the smallest change between inhalation and exhalation and 3 being the largest change in pressures.